One of the primary responsibilities of the Clinical Consortium-Coordinating Center (CCCC) is to assist the efforts of the Clinical Study Sites by providing scientific, strategic, and administrative leadership and support to help fulfill the Consortium's overarching aims. This includes but is not limited to coordinating the adoption of a Uniform Data Set to standardize measurement of psychological health problems related to deployment, and facilitating the rapid selection, design, and execution of clinical studies within the Consortium. 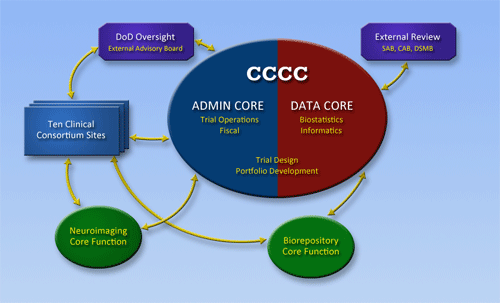 The Clinical Consortium-Coordinating Center (CCCC) is organized to include an Administrative Core and a Data Core. The primary responsibilities of the Administrative Core are Fiscal and Trial Operations. The responsibility for Trial Design and Portfolio Development are shared with the Data Core. The primary responsibilities of the Data Core are Biostatistics and Informatics.